I hate to use the phrase de rigueur again, but if there ever was a need for it, this is a prime example. Because familiarity with this image, View of the World from 9th Avenue, is de rigueur for every New Yorker and anyone who wants to understand this city's people. 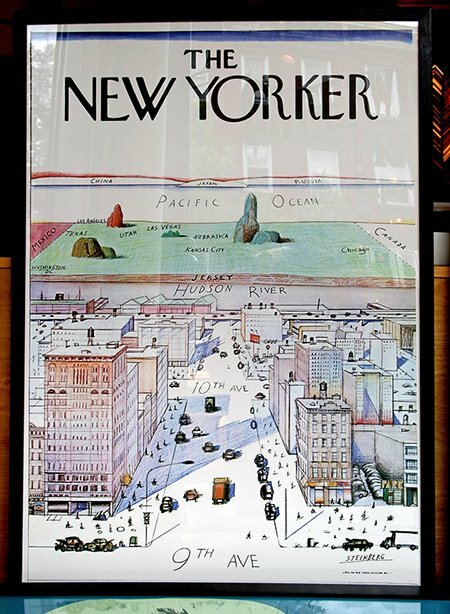 This really is how many of us see New York City. I actually visualize the world much like this at times - when I first saw this work, I was stunned as to how close it was to my mind's perspective of the world. Note how inconsequential things outside the city are depicted. Ironically, the area of Manhattan shown is itself one of the least important, yet it still looms large over other cities, states and countries. The density of people and services is so great here that it really is possible to go quite some time without leaving - many Greenwich Village residents joke about how they never go north of 14th street for months or even years at a time. Manhattan is literally a world unto to itself and center for a myriad of industries. It is very easy to adopt a world view not too far from this work of art.